Nice man. I still have mine in the box from when I bought it years ago. Haven't even opened up a bag. Yea i honestly don't want to touch it just yet, I know I'll just end up snapping it and putting it on a shelf. I had to pick it up though, it was 110 shipped. Couldn't pass up that price. Someone built that PG for my local annual model show last year, and it looks really good. Stopped into my local hobby shop for a bit of paint, but got this instead! 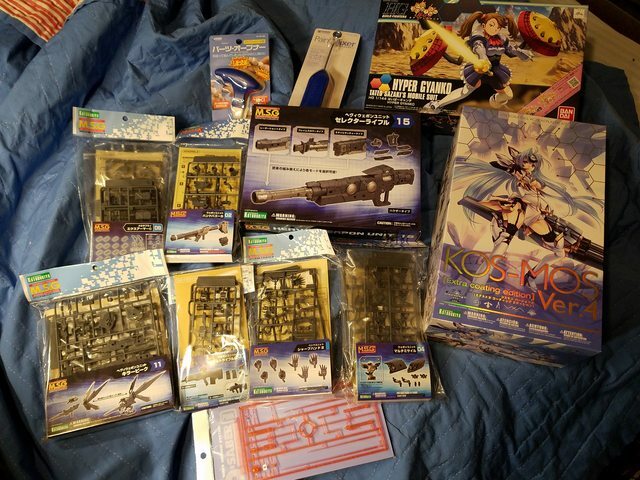 The Groud Type Gundam and tallgeese are from my local hobby store. The rest was my Black Friday haul from HLJ. That's an amazing price! And yeah, I want to add detail to the armor on mine. Yea i'm debating grabbing a resin conversion, but i kind of want to do it myself. This one is appealing. Took about a month off from building anything, but with multiple contests going right now, figured I'd get back into things. As it's happened, had a delivery from HLJ arrive last week. My mall store does, you can also find them at some Gamestop. GameStop sells Gunpla now?! When did that happen? I've got three GameStops near me and this is the first I've heard of them selling Gunpla. Yea they do in store near me. Idk about online. My usual gunpla hunt is Thinkgeek, Barnes and Noble, Gamestop, Local hobby store in that order lol. A large Gamestop near me did for a time. But seems like after they sold out of them, they never got in any more.